IID supports its members’ creativity and innovative thinking by supporting the publication of books and papers on agriculture and livelihoods from a scientific and cultural perspective, all important drivers of actions by farmers. In addition, IID also supports the production of films and documentaries which relate to international development issues. 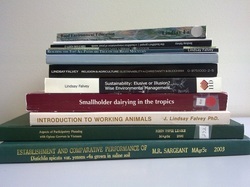 IID has been associated with the publication of several books related to issues of International Development, Development Consulting, Education and Training in Agriculture, Natural Resource Management as well as with the influence of local cultural traditions on agriculture and livelihoods, including influences from Christianity, Buddhism, Vedic and other religious traditions. Several publications are available for purchase, others can be downloaded for free.